12 Red Rose 1/2 Kg. Black Forest Cake.Delight your loved ones with this combination of Red Rose bunch and freshly baked delicious Black Forest Cake.The cakes are hand delivered to ensure freshness. 12 Red Rose 1 Kg. Black Forest Cake.Delight your loved ones with this combination of Red Rose bunch and freshly baked delicious Black Forest Cake.The cakes are hand delivered to ensure freshness. 24 Red Rose 1/2 Kg. Black Forest Cake.Delight your loved ones with this combination of Red Rose bunch and freshly baked delicious Black Forest Cake.The cakes are hand delivered to ensure freshness. 24 Red Rose 1 Kg. 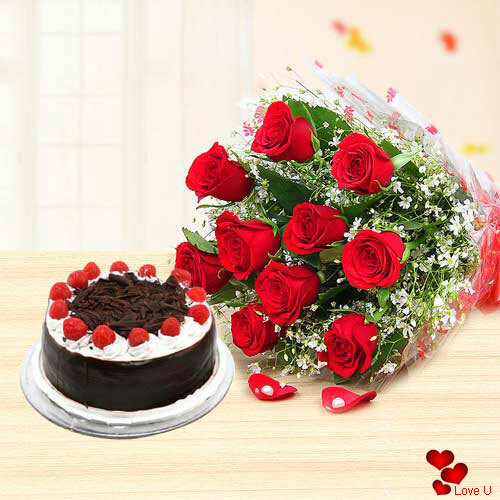 Black Forest Cake.Delight your loved ones with this combination of Red Rose bunch and freshly baked delicious Black Forest Cake.The cakes are hand delivered to ensure freshness.